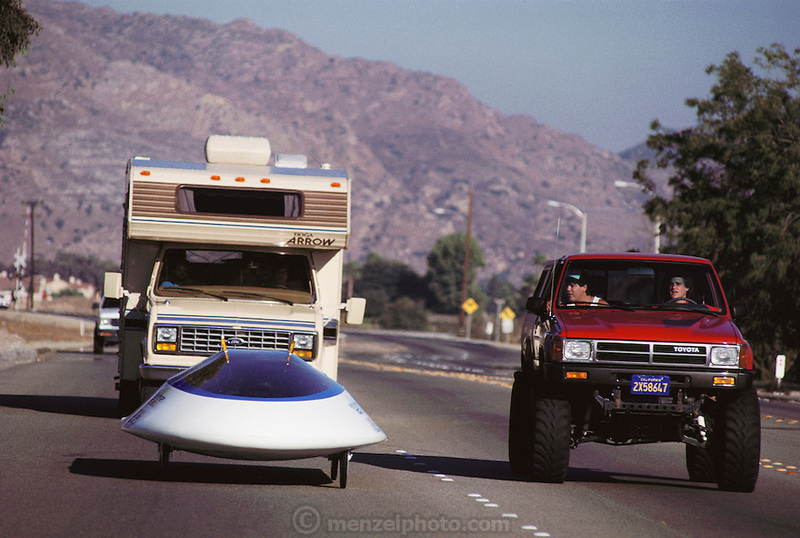 Sunraycer is being followed by its support vehicle during a road test in the California Mojave desert USA. Sunraycer, General Motors' entry for the Pentax World Solar Challenge, the first international solar-powered car race, which began in Darwin, Northern Territories on November 1st, 1987 and finished in Adelaide, South Australia. Sunraycer was the eventual winner, taking 5 1/2 days to complete the 1,950 miles, traveling at an average speed of 41.6 miles per hour. Strict rules were applied throughout the race. Entrants were permitted two 2-hour solar battery charging sessions per day, performed immediately before & after each daily stage. (1987).